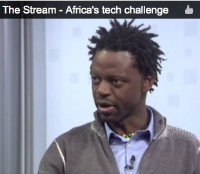 The Stream: What are some most exciting developments right now in the African tech industry? Teddy: Speaking of infrastructure, I think one of the most exciting things happening right now are the tech hubs springing up all over the continent. I think these incubation spaces are going to be the unsung heroes for Africa’s emerging digital economies because they solve a lot of the problems that young digital entrepreneurs face in honing their craft. You have connectivity, support structures, mentorship and collaboration. I’d watch this space as they multiply and mature. There’s a start-up in Congo, VMK that just launched the first African designed, China manufactured smart phone and are working on a tablet. This is big. I expect a lot more just like this one in the coming years and hopefully we’ll even bring that manufacturing to home soil as well. Open government movement that is starting to take hold. Releasing government data into the public domain is going to be a huge catalyst for developers to create tools to analyze, interpret and identify where they can build digital solutions. Can’t say enough about the full potential of mobile money payment systems on the continent. I think once we harmonize those services across carriers, then we’ll truly have the beginnings of new digital economies on the continent. I think you are going to see a decline or a revolution in the traditional banking sectors and this is huge. I think this will help create demand for investment in transportation infrastructure for delivery of goods and services. Additionally, the influence this will have on integrating economic zones and breaking down trade barriers is huge. App economies will of course lead on the backs of multinational carriers streamlining their services and hopefully traditional markets will also open up.